critical and theoretical writings. After reviewing theories of signification, the production of meaning, and materiality, she analyzes the work of four poets active in the typographic experimentation of the 1910s and 1920s: Ilia Zdanevich, Filippo Marinetti, Guillaume Apollinaire, and Tristan Tzara. 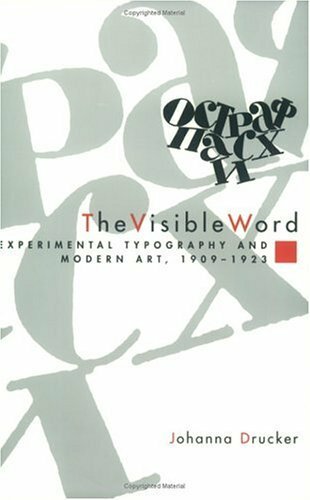 Few studies of avant-garde art and literature in the early twentieth century have acknowledged the degree to which typographic activity furthered debates about the very nature and function of the avant-garde. The Visible Word enriches our understanding of the processes of change in artistic production and reception in the twentieth century. Johanna Drucker is the Robertson Professor of Media Studies in the Department of English at the University of Virginia. She is the author of several books, including The Visible Word, The Alphabetic Labyrinth, The Century of Artists' Books, and Figuring the Word.